Do you ever watch Chopped? It's the show on Food Network where the contestants are given baskets with three mystery (and often odd) ingredients with which they must conjure up appetizers, entrees, or desserts within impossible time limits. It's fun to watch and I'm often amazed at the interesting dishes the contestants come up with in such a short time. It has occurred to me, however, the reason we're so attracted to this show is its similarity to our own experiences in the kitchen. Doesn't nearly every home cook have times where they must prepare a dish with whatever they have on hand and in a limited amount of time? If you're like me, it's an almost daily occurrence. To give you an example, the other day I was faced with a pint of blueberries that had to be dealt with. I had procrastinated for the better part of a week and they had to be used up before they got wrinkly and gross...I hate to waste food. Now, it was early morning and I had to get ready for work...what to make quick? Muffins! A quick survey of the fridge and cupboard told me that I had the basics...flour, sugar, vanilla...there was a lime and some lime yogurt...oh yes...coconut, some coconut milk, and if I wasn't mistaken...coconut oil! I had a theme! Over the years, I've come to love these kitchen adventures. In fact, it has translated into a couple of hobbies, one being this blog and the other? Cooking contests! Yep, it all started with my obsession with getting into the Pillsbury Bake-Off. It was a lofty goal and it took me many years, but I did it! Holy cow was that an exciting event....so much so that I was concocting new recipes in my head on the plane ride home. While I didn't win a prize that time, I came home with a plethora of foodie friendships that I can't begin to put a price tag on. To be honest, the friendships that I formed from that one experience began several months before I actually participated in the event. How? Because I became a member of Cooking Contest Central as soon as I had my entries in to Pillsbury, even before I found out that I was a finalist. I had been a member of CCC several years earlier, so I knew what it was all about and I wanted to be sure that I had all of the up-to-date information on the Pillsbury Bake-Off that year. What I didn't count on was all of the support from so many people, many of whom had already gone to the Bake-Off. Not only was I able to connect with people that had the same interest, I had access to all of the latest cooking/baking contests, and I had the ears of actual contest winners. I didn't expect to be swept up into so many different contests, but the best part was when I did find out that I was a finalist at the Pillsbury Bake-Off, I got to share that excitement with about 30 others who were also chosen! 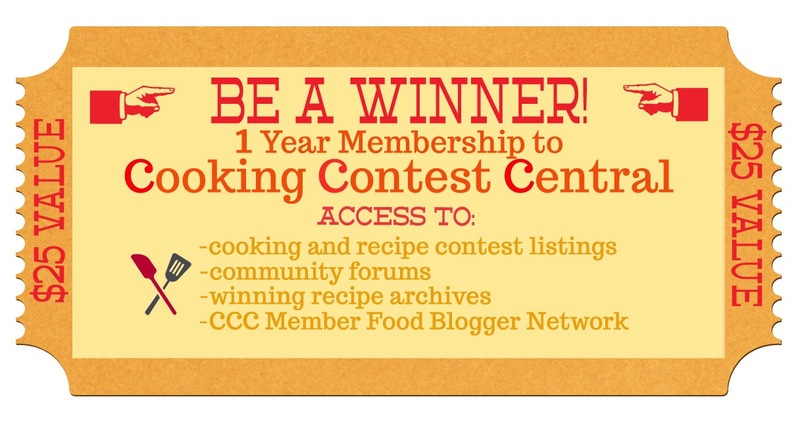 To share the contesting fun, Kristina over at CCC is allowing me give you a chance to win a 1 year membership to CCC! 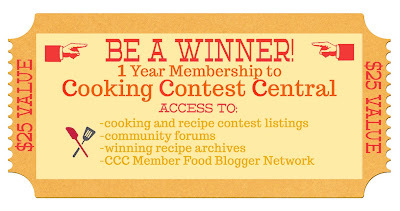 Simply enter through the Rafflecopter widget at the bottom of the page....you can "like" The Dutch Baker's Daughter and Cooking Contest Central on Facebook for a couple of entries or, if you don't have a Facebook account, just leave a comment telling me whether you prefer to enter cooking contests or baking contests. :) Easy. Bloggers--you won't feel left out of CCC---there are special contests just for bloggers and you could gain a whole new audience! And now for the muffins---they turned out to be so good!! 2. In a small bowl, stir together 1/4 cup sugar and 1 teaspoon lime peel; set aside. 3. In a large bowl, whisk together the flour, baking powder, salt, coconut, and remaining lime peel and sugar. Stir in the blueberries and set aside. 4. Add the milk, the egg and the yogurt to a large, microwave safe measuring cup. Use a fork to blend the mixture. Microwave for about 30 seconds, or just until the mixture is at room temperature; stir in the coconut oil and the vanilla. Add the milk mixture to the flour mixture and gently stir with a rubber spatula until just blended. 5. Spoon the batter into the lined muffin cups. Sprinkle the sugar/lime mixture over the tops of the muffins. Bake for 17-20 minutes, or until the tops spring back when lightly touched. Remove the muffins from the pan and cool on a wire rack. Definitely baking contests. Baking takes precision and a really good recipe to follow. Definitely baking. Baking takes precision and a really good recipe to follow. I'm a cooking contest girl!